November 16, 2017 — HAWC has captured the first wide-angle view of very-high-energy light emanating from two rapidly spinning stars. The fresh perspective on these stellar neighbors — which are both close to Earth in cosmic terms — casts serious doubt on one possible origin for a mysterious excess of particles near Earth whose origin has tantalized scientists in recent years. Scientists have debated the cause of an unexpectedly high number of positrons — the anti-matter cousins of electrons — near the Earth since a space-borne detector measured the anomaly in 2008. Some have speculated that the extra positrons have an exotic source, perhaps originating from as-yet undetected processes involving dark matter — the invisible but pervasive substance seen only through its gravitational pull. Others have suggested something more pedestrian: The extra particles might originate from nearby collapsed stars, called pulsars, that spin around several times a second and throw off electrons, positrons and other matter with violent force. Using new data from the HAWC Gamma-Ray Observatory, an international team of researchers has made the first detailed measurements of two extended pulsars, Geminga and its neighbor PSR B0656+14, that had been identified as possible sources of the mysterious excess of positrons. These measurements demonstrate the capability of the HAWC detector to observed such very extended objects. Relatively close galactic objects, like these two pulsars, appear so extended that one can only see them with an instrument with a wide field-of-view. Using data from the HAWC Observatory, we provide a unique and complementary view of these very extended sources that is not possible with the more pointed gamma-ray telescopes. The results appeared in the Nov. 17 issue of the journal Science. Read more about this results HERE. Citation: A.U. Abeysekara et al., “Extended gamma-ray sources around pulsars constrain the origin of the positron flux at Earth.” Science. Vol. 358, November 17, 2017, p. 911. doi: 10.1126/science.aan4880. The 300 water Cherenkov detectors ready for the official inauguration. Construction of the HAWC Observatory began four years ago. Today (March 20, 2015), the detector was formally inaugurated by members of the collaboration, representatives from collaborating institutions and the particle astrophysics community, and representatives from CONACyT, the US National Science Foundation (NSF), and the US Department of Energy (DOE) in a ceremony at the detector site at Sierra Negra. The ceremony capped a two-day event celebrating the completion of HAWC. On Thursday March 19, over 250 people participated in an inaugural symposium surveying the state of high energy particle astrophysics at the Complejo Cultural Universitario of BUAP in Puebla. The speakers included guests from most of the major gamma-ray, cosmic-ray, and neutrino observatories in operation around the world, as well as leading theorists in the field. Prof. Peter Mészáros from Penn State gave a lecture on the state-of-the-art in the study of gamma-ray bursts. On the day of the inauguration, HAWC collaborators and invited guests traveled up the mountain to tour the HAWC site and view work by school children and artists from the town of Texmalaquilla. At noon, Enrique Cabrero, director of CONACyT, and France Córdova, director of NSF, officially inaugurated the detector by starting a new data acquisition run. Prof. Miguel Mostafá proudly showing off the PMT (deploying and) mounting mechanisms designed and built by his research group. Prof. Miguel Mostafá was the task leader responsible for the deployment of the 300 water Cherenkov detector. His research group designed and build the 300 plastic bladders that hold the 200,000 liters of ultra-pure water inside each detector. His group also designed a dedicated system for deploying the photo-multiplier tubes in their precise location inside the detectors. Bladders were the only major detector component that was constructed by the collaboration. Commercial bladders did not satisfy the strict requirements of the scientific instrument. Namely, despite being 5 m tall and 7.5 m in diameter, bladders must be absolutely light-tight. Now, with data from the full Observatory, the Penn State group is concentrating its efforts in new TeV sources, detection of gamma rays from GRBs above 100 GeV, extragalactic gamma ray diffuse emission, and dark matter emission from the Galactic center! Stay tuned for the discoveries coming from HAWC!!! On August 1, 2013, the High-Altitude Water Cherenkov (HAWC) Gamma Ray Observatory formally began operations. HAWC is designed to study the origin of very high energy cosmic rays and observe the most energetic objects in the known universe. This extraordinary observatory, which uses a unique detection technique that differs from the classical astronomical design of mirrors, lenses, and antennae, will position our country at the forefront of scientific and technical knowledge. HAWC is located at an altitude of 14,000 ft (4,100 meters) above sea level on the slope of the Pico de Orizaba at the border between the states of Puebla and Veracruz. The observatory, which is still under construction, uses an array of water Cherenkov detectors to observe high-energy cosmic rays and gamma rays. Currently 111 out of 300 Cherenkov detectors are deployed and taking data. Each Cherenkov detector consists of 200,000 liters of extra-pure water stored inside an enormous tank (5 meters high and 7.3 meters in diameter) with four highly sensitive light sensors fixed to the bottom of the tank. Status of the HAWC array on August 1, 2013. 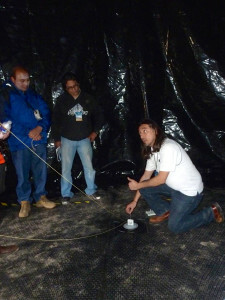 The construction and operation of HAWC has been made possible by the financial support of several Mexican institutions, and the National Science Foundation (NSF), the Department of Energy (DOE), the Los Alamos National Laboratory (LANL), and the University of Maryland in the United States. The HAWC array, operating with 111 Cherenkov detectors since August 1, has begun sensitive detections of high-energy particles and radiation between 100 GeV and 100 TeV.